Lille is a very popular destination for an educational art trip, it is cosmopolitan and incredibly accessible being making it the perfect place to absorb French culture and visit the cities excellent art galleries and museums. Popular attractions on a school art trip to Lille include the Palais Des Beaux Arts de Lille (Lillie Palace of Fine Arts) which is the second most popular art museum in France, second only to The Louvre. For contemporary art head to the Museum of Modern Art. This unique structure resembles a lego house and houses art work by early 20th century artists including Lewis Baltz, Pablo Picasso and Robert Filliou. To complement museum visits, the Grand Place and attractive old town provide many sketching and photography opportunities. 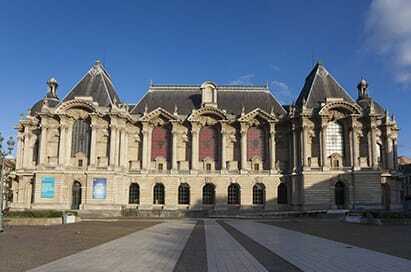 Second only to the Louvre in France, the Fine Arts Museum contains dazzling masterpieces of the Flemish and Dutch school. Its prestigious collection houses some 2,000 paintings representing artists such as Rubens, Raphael, Goya, Donatello and Bout as well as a large collection of drawings and a sculpture gallery with pieces by Rodin, Claudel and Bartholdi. Located in the heart of Old Lille, the museum is housed in the hospital which was founded in 1237 by the Countess Jeanne de Flandre and which remained in service until 1939. It is now the setting for a collection of paintings, tapestries, wood sculptures and porcelain from the region, thus creating the atmosphere of a 17th century Flemish small convent. The Museum building looks like a construction of Lego bricks set in a leafy sculpture park. It illustrates the amazing diversity and vitality of the French artistic scene in the early part of the 20th century, with works by Derain, Kees Van Dongen, and cubists such as Braque (1862-1963) and Picasso (1881-1973) - who caused a storm of controversy in their day. The collection has international scope, including works by surrealist Miró, Masson, Klee, Kandinsky. Located an hours drive from Lille in the town where Henri Matisse was born this museum is one of France’s relatively unknown but formidable collections of art. It takes you through the artist’s artistic life, giving a proper appreciation of how Matisse came to make those vibrant, colorful, sweeping images in paintings, drawings, sculptures and inspiring paper cut-outs.